The 45.72 metre motor yacht Silver Wave, listed for sale by Benjamin Bensahel at G-Yachts, has had a further €1,600,000 price reduction. Designed by Nuvolari Lenard, Silver Wave was built in aluminium by Palmer Johnson to Lloyd's class and MCA compliant, with delivery in 2009 as the fifth hull in this highly successful range of performance superyachts. Powered by twin MTU 16V 3,650hp diesel engines, she comfortably cruises at 24 knots and has a top speed of 27 knots. A guaranteed head-turner, she has excellent deck areas including a large flybridge/sun deck with spa pool, sunpads and dining area, a further seating area and sunpads on the aft deck and a private seating area with sunpads on the fore peak. She also benefits from a silver-grey paint job, new in 2017. This yacht for sale has a large and elegant saloon with an adjoining dining room and bar, while her extensive deck areas offer a total of three al fresco dining areas for up to 12 guests. A highly popular charter yacht, she also has a gymnasium with an elliptical trainer and a treadmill. In addition, all cabins, saloons and exterior decks are equipped with full audio/visual systems including ten large television screens. 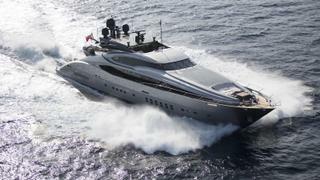 Fitted with zero-speed stabilisers, Silver Wave is now asking €8.9 million.